Ratha Sapthami is a very auspicious day. The Sun god travels in the north and south directions in a year. These are called Uttarayanam (the first half of the year) and Dakshinayanam (the second half of the year). The first half is considered most auspicious than the second half of the year. This is the day that Surya was born to sage Kashyapa and his wife Adithi. and hence celebrated as Surya Jayanti. Ratha Saptami marks the seventh day following the Sun’s northerly movement (Uttarayana) of vernal equinox starting from Capricorn (Makara). It is symbolically represented in the form of the Sun God Surya turning his Ratha (Chariot) drawn by seven horses, with Aruna as the charioteer, towards the northern hemisphere, in a north-easterly direction. The symbolic significance of the ratha and the seven horses reigned to it is that it represents the seven colors of the rainbow. The seven horses are also said to represent the seven days of a week starting with Sunday, the day of Sun god Sury a. The chariot has 12 wheels, which represents the 12 signs (each of 30 degrees) of the Zodiac (360 degrees) and constituting a full year, named Samvatsara. The Sun’s own house is Leo (Simha) and he moves from one house to the next every month and the total cycle takes 365 days to complete. The Ratha Saptami festival seeks the benevolent cosmic spread of energy and light from the Sun God. There are numerous references to praising the Sun to enhance good health and prosperity, in the Vedas. Some of these Vedic hymns were incorporated into Nitya Vidhi (Daily mandatory routine for a Hindu). These daily procedures were termed Surya Namaskara (literally translates as "sun salutations"). 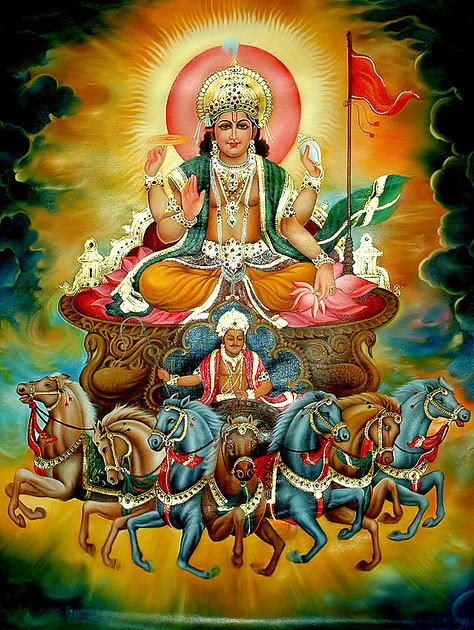 Many people worship Surya because he is called as “Aarogya and Aishwarya Datha” (provider of health and wealth). Surya is worshipped early in the morning while fresh sunrays emerge. It is believed and proven that exposure to fresh sun rays rejuvenate energy, and purify the mind and body.